Medicare developed a scale reflecting the quality of patient care amongst home healthcare agencies. This star rating system summarizes 9 of the 29 quality measures reported on Home Health Compare which is available for the public to review at www.medicare.gov. Prior to 2019, Precise Home Care, LLC has consistently been rated with 4.5 out of a possible 5 stars regarding their quality of care since Medicare’s inception of the star rating system in 2016. 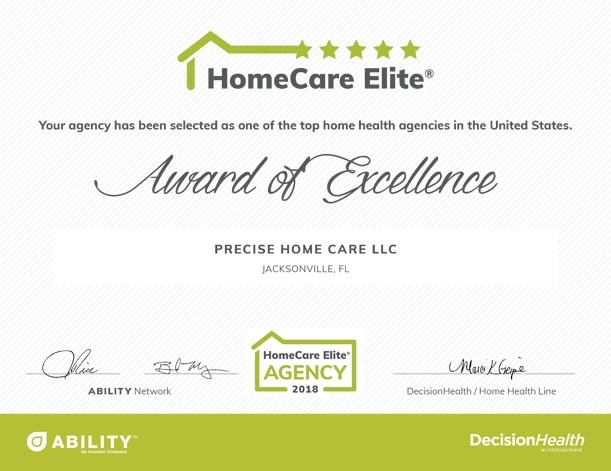 Precise Home Care is proud to announce that we are in the top 500 agencies in the U.S. out of 9,996 Medicare-certified home health agencies analyzed in the nation. There are only 2 agencies in our area that were awarded this achievement. Home Care Elite recognition is based on performance measures such as quality of care, patient experience, quality improvement, consistency and process measure implementation. Agencies cannot pay to participate in this evaluation. Results are based on publicly available information with further details on www.nationalresearch.com. 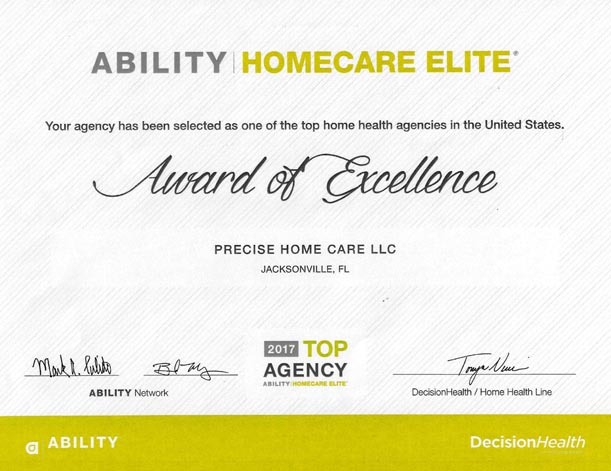 Precise Home Care would like to extend our thanks to all of our loyal customers in helping us to achieve these results. We welcome any feedback in ways to continue improving our service to you as we strive to become better partners in healthcare. 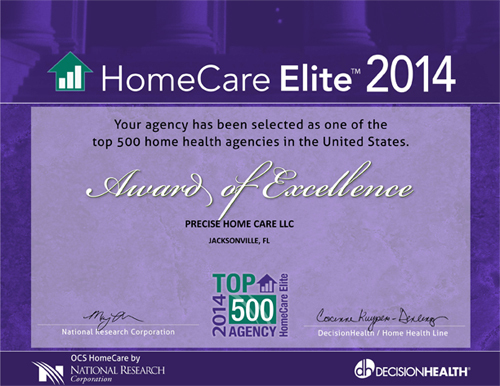 2014 Homecare Elite Award Details. 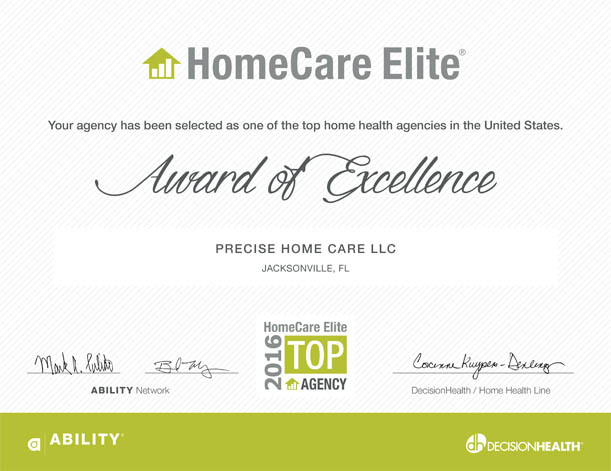 Precise Home Care is recognized as being in the top 25% nationwide based on performance measures. Award details. 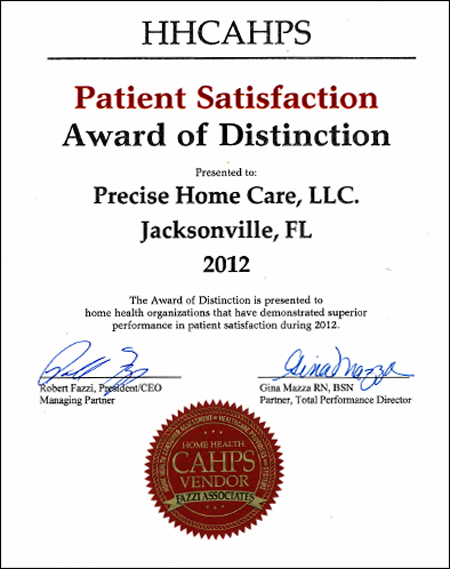 HHCAHPS recognizes Precise Home Care with Award of Distinction for Superior Performance in Patient Satisfaction.